Calling Academy Award winning actress Shirley MacLaine “iconic” might well be an understatement. TailSlate loved her in 2011’s Bernie with Jack Black and Matthew McConaughey. Now she is back in The Last Word, playing a woman named “Harriet Lauler” who belongs in a Hall of Fame for control freaks. After a difficult moment, the octogenarian realizes that how she will be remembered in her obituary is beyond her ability to control. Determined to change that she visits the local newspaper’s editor-in-chief, “Ronald Odom” (Tom Everett Scott) whose father she had had a long business relationship with. Wanting to keep his newspaper afloat and hoping that Harriet will make that possible with a bequest in her will, he agrees to let her meet with the paper’s obituary writer. “Anne Sherman” (Amanda Seyfried – Lovelace, A Million Ways to Die in the West) has a memorable meeting with Harriet and then goes out into the area of Bristol to talk to the dozens of people Harriet listed for her. None of whom has a single good thing to say about Harriet. Harriet takes a job at a local radio station as a disc jockey almost by force. This is a radio station where the “jocks” choose their own music. The fact they use records and not CDs or computer-generated music is intriguing. As someone who was an FM jock in the 1980s, the board Harriet used for her show looked very much like the one I was using back then. Harriet is a natural. What might have been a mediocre movie is elevated by the superb work of its two leads. Amanda Seyfried more than holds her own in shared scenes with Shirley MacLaine, in spite of Ms MacLaine’s wonderful work. What might have been a series of one-liner confrontations becomes so much more. Although it must be admitted that some of those one-liners are as sharp as the edge of a Hattori Hanzo katana. Yes, that is Gedde Watanabe as the gardener and Philip Baker Hall as Harriet’s ex-husband. A reminder that it has been too long since I watched Paul Thomas Anderson’s electrifying debut feature film, Hard Eight. 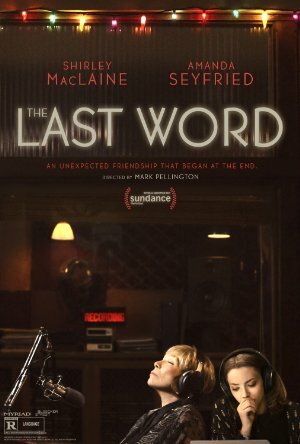 The Last Word opened in limited release in Los Angeles and New York City on March 3, 2017 and will open in more cities in the weeks to come. Plot: Harriett is a retired businesswoman who tries to control everything around her. When she decides to write her own obituary, a young journalist takes up the task of finding out the truth resulting in a life-altering friendship.